Boating can get expensive, fast! I needed these and it took some time to locate them and they cost a lot more than I think they should have. None-the-less, I needed them! You didn't "need" them you "wanted" them. I haven't had a wind instrument for 5 years. You kind of need those if you have an autopilot and not a wind vane. No you still don't "need" them! Do you really "need" a boat? Gotta go with "Cockpit cushion weight" here. Certainly don't need one, especially on a 30-footer (if I read your info correctly). A few strips of yarn will give you the same directional info (or wind in the face, or a pipe). Speed is pretty easily read from the seas. Windy instruments are certainly nice to have (I have one now), but they are not needed, not even for an electric auto. We sailed our ~1500 nm last season without either, and we have both (a windvane and an electric auto). Technically, you're correct: one can use simple yarn telltales pay attention to how the breeze is on the back of your head, which ear has more, etc.. However, in all honesty, I do think it is quite useful to have electronic wind gauges, most especially when sailing deep, out in the ocean's large swells, as it helps avoid accidental gybes, but still allows one to run off to accomplish whatever one needs to to forward. *Stuff* just happens, sometimes, and it can be necessary to go forward to do something, possibly re-secure something, and best to avoid the accidental gybe. On our first ocean passage, I might have lost Jim that way, due to inexperienced helming in the conditions we had. So, my word for the OP is, congratulations! Use your new instruments well, and in good health, but do NOT become dependent on them, practice relating where you feel the wind on your body to what the instruments tell you, because, in a pinch, when you're reacting by reflex, you want to respond in the better way. Funny I'm the one saying you don't need a wind instrument with others finding ways to suggest that you do need one. If you want one and are willing to pay for one there is nothing wrong with just saying so. Blind persons have done successful singlehanded long ocean passages. This proves that you don't NEED vision to sail. I prefer to be able to see when sailing, and I prefer to have wind instruments. Sematic arguments about NEED don't add much to our knowledge base. Lets morph this thread into ways to justify our wants and come up with the best supporting comparison story to envision it. On a little more serious note - our Raymarine wind instrument is acting up from time to time and i suspect the sensor on a mast top. Would be looking for replacement unit when getting nearer to "civilization". Won't be cheap, that's for sure. 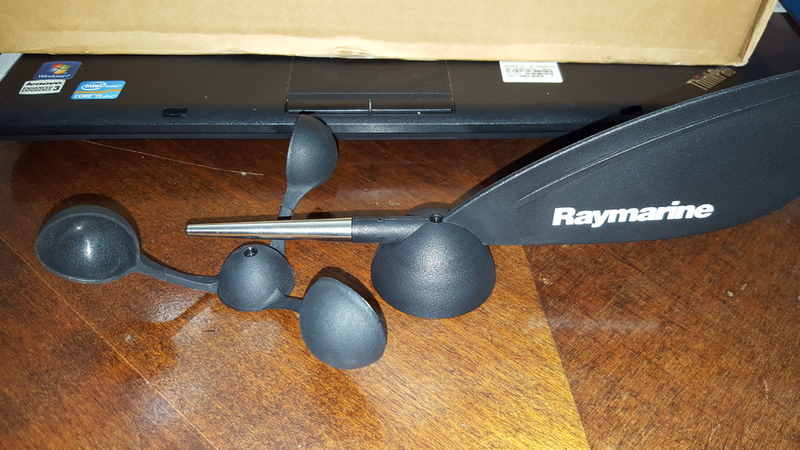 Has anybody repaired Raymarine wind sensor successfully? I mean what ever electrical bits are inside of that mast top unit. 90% of problems with wind instruments are in the wiring, not the sensor. Suggest you check that thoroughly first. Rule #1 One does not have to justify any yacht related expenditure as all yacht related expenditure is essential. On your boat is there a junction box near the base of the mast to allow disconnection when unstepping the mast? That is a common failure point IME.